When the Minnesota Twins can’t play because of a thunderstorm, they are “rained out.” When we can’t ride because of a thunderstorm, we’re “rained in”. That’s the situation this morning. It’s been a long, hard work week. We thought we’d take a breakfast ride this morning. There’s nothing like a motorcycle ride to stimulate your appetite; I usually gain two or three pounds when we take a road trip and spend a month trying to lose them again. We have ridden into thunderstorms. There was a hell of a one, complete with hail, as we climbed the highway to Mesa Verde, Colorado. The sound of those little balls of ice bouncing off my helmet was loud! 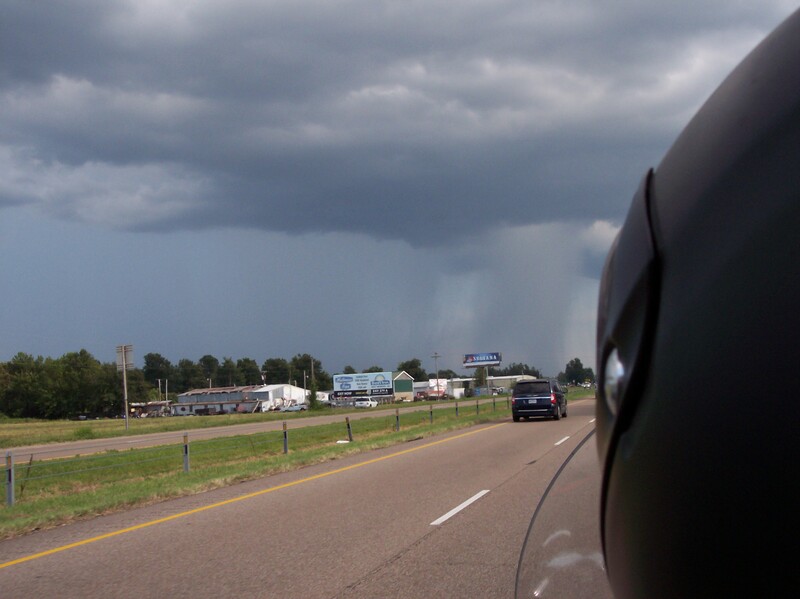 And there was the one we knew we’d get caught in as we entered Memphis, Tennessee. We saw the flat anvil top of the clouds a long time before we encountered the rain, thunder and lightning on the freeway exit. Thankfully, it was at the end of a day’s ride and we were able to get out of our wet leathers quickly. Sometimes riding in the rain is unavoidable. That’s what rainsuits are for. Sometimes, like the Minnesota Twins, you just need to wait the storm out. This past weekend, a motorcyclist in Oregon died when a bear ran out in front of him on the highway and they both crashed into an SUV in the opposite lane. The driver of the SUV was hospitalized in serious condition. Last week, a biker in southeastern Minnesota, where there are lots of Amish folk, crashed into a horse that bolted from its pasture and suddenly appeared on the road before him. Horse and rider both died. When you’re traveling on curvy country roads, be on the alert for wandering wildlife. That bump on the road might be a snapping turtle, or a skunk. Best to avoid either if you can. Deer, as a rule, move around a lot during the earning morning hours and in the hours just before and after dusk. But they don’t always follow the rules. I’ve seen them come to the roadside at 10 a.m. and in the middle of the afternoon. Fortunately, they’re naturally timid and a “snort” from the motorcycle sent them back to safe cover. But that doesn’t always happen, either. Buffalo are another matter. They trot or amble down the roads in Custer State Park in South Dakota and Yellowstone National Park in Wyoming like they own them. Bikers are well advised not to get too close and not to rev their engines. 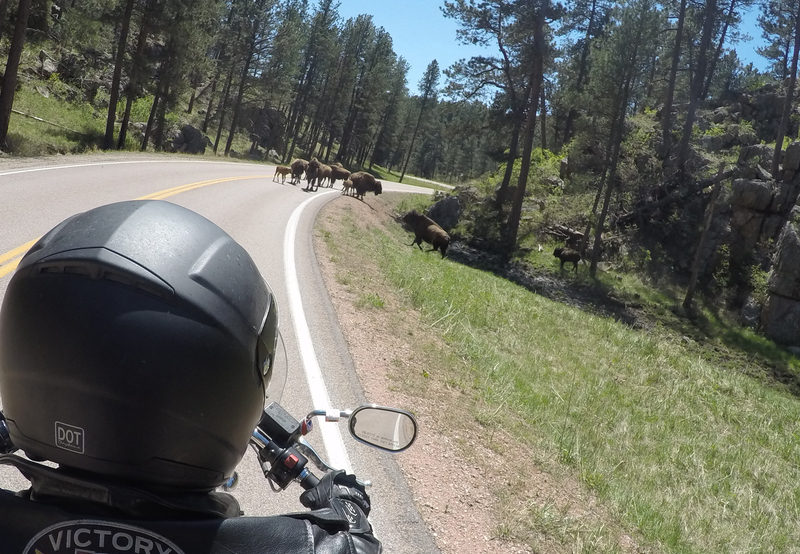 Bison love a challenge, and they’ll gladly take on that iron horse you’re sitting on. From 2004 through 2013, the Oregon Department of Transportation recorded 431 crashes involving motorcycles versus wildlife. More than 61,000 vehicle-deer related crashes occurred in Michigan in 2009, with 10 fatalities. Those 10 killed were all on motorcycles. And for God’s sake, wear a helmet!